In 1939 Poland was attacked by both Nazi Germany and the Soviet Union. Members of the Polish armed forces who managed to escape capture headed for France. When in the summer of 1940 France fell the Poles headed for Great Britain. On arrival in Britain they were sent north to Scotland. There they were reformed into the 1st Polish Corps and given the task of defending the east coast of Scotland against the threat of invasion by German forces. In Poland the Soviet Union occupied the eastern half of the country. Stalin, the Soviet leader, deported 1.7 million Poles to slave labour camps in Siberia and Kazakhstan. In June 1941 the attack by Nazi Germany on the Soviet Union led to Stalin granting Polish prisoners an "amnesty". A Polish army was formed in the Soviet Union under the command of General Wladyslaw Anders. In 1942 Stalin allowed the evacuation of this army and the soldiers families to Persia. The Poles went on to fight major battles against the Germans in Italy under British command. At the end of the war with Poland under Soviet occupation there was no free country to return to. Many of them came to Britain and by 1946 there was around 250,000 Poles in the country. 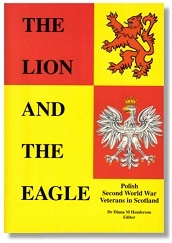 The Lion and the Eagle is a book which contains the reminiscences of Polish veterans who remained in Scotland after the war. Captain Tadeusz Apfel-Czaszka (1st Polish Armoured Division) recalls being in France at the time of the French surrender. Zbigniew Budzynski (5th Polish Infantry Division) remembers being taken prisoner by the Red Army after the Soviet Union invaded Poland. He was taken by train to Murmansk and from there by boat on the White Sea to a labour camp at a place in Siberia called Ponoy. In August 1941 the Soviets set him free and he made his way south to join the Polish Army. Lech S Muszynski describes how his father had fought for Polish independence. In 1939 Lech's father made his way to Hungary and then to Britain. Lech, his mother and his sister, remained in Poland. In February 1940 the Soviet Secret Police (NKVD) banged on the door of their house at 3am in the morning. They were loaded onto a train of cattle trucks and deported to the Soviet Union. They were taken to a labour camp in the Archangel Region of Northern Siberia. They remained there for about 18 months. Publisher - Published by Cualann Press in 2002. This page was added on 21 January 2010.